Have you ever had one of those days that seemed extremely short while you were living it, and then extremely long when you look back and see everything you accomplished in such a short time? Yep, that’s how my day has been. Well, I almost missed my Monday post due to an unusually long To Do list today. 🙂 Forgive me for being tardy? By the time I even sat down to write about my latest battle with my newest WordPress client who also purchased Thesis (my most favoritest WordPress theme ever <- tiny bit of sarcasm there) I realized that I didn’t even want to think about it again for the rest of the night. LOL! So, I am going continue that little beauty tomorrow (truly, it is turning out very nice even if I do say so myself 😉 ); and tonight I needed to search for a little comic relief. We all need to have a laugh every now and then, keeps the spirits high. 1. You’ve said “OMG” or “LOL” out loud… and no one was in the room to hear you. 3. You’ve had to work from some type of makeshift virtual office at some point or another within the past year. 4. You are addicted or are in recovery of an addiction to Facebook (or other social networking service). How would you know if you are addicted to Facebook? My Aunt passed away this past January. Her bank billed her for February and March for their monthly service charge on her credit card, and then added late fees and interest on the monthly charge. The balance had been $0.00, but had now grown to somewhere around $60.00. Bank: “Could you fax us a certificate of death? Teach him to use the Internet, and he won’t bother you for weeks! 😉 Ok, that’s all I have for today. Try to laugh more off this week, and if you know of any other fun stories please do share! If you’re like me, being in the Social Media atmosphere you’ll find someone, or maybe a couple of someone’s to follow and “learn” from. Maybe you follow them to see what their next move is, or simply like what they’re doing and how they’re using Social Media. One thing that keeps my interest is when the experts keep it real. I’ve had the pleasure of working with two very special Social Media Experts that have so much to offer. Both of these gentlemen are genuinely interested in others, as well. Their business is built on relationships – and it shows. They have definitely learned the ways of Social Media. I’ve seen with my own eyes how huge an asset they are to their clients, whether it be Corporations or the Small Business owners. Each of these individuals know how to take the Social Media experience to higher grounds. Nathan Kievman: Founder & CEO of DemingHill, a leading Corporate Social Media Consulting & Marketing Firm. DemingHill is a consortium of the top thought leaders in each of the core disciplines of Social Media. Nathan is a LinkedIn wizard and knows his stuff when it comes to Social Media. He takes the time to build relationships and connect with others. Just the other day, during a phone conference, Nathan asked “How are you – is everything going ok for you?” and took the time to listen to what I had to say. Those moments are very rare in this day and age. So, here’s a little about who I consider experts…Who’s your expert? Who do you follow that is generally interested in you or their followers? Launch Gum is an energy drink in a chewing gum. One can of launch gum contains 9 sugar free pieces, the energy equivalent of 7 energy drinks. Launch United is an unprecedented online social network, where individuals buy launch gum, become Launch Reps, build a community and manage a grassroots salesforce. The product and company were developed and founded by Justin & Eric — @launchgum & @pilonbignell. Launch Gum started when I knocked over Eric’s energy drink with an errant basketball shot and he made the ridiculous comment that “they should make an energy drink that does not spill”. From there we developed Launch Gum, an energy drink in a chewing gum. We started the company a few years back, right out of university and began selling around campus, out of the trunk of our cars, to local shops etc. Our customers were amazed by the innovation, effectiveness, taste, value and convenience. Our awareness and distribution exploded nationally and internationally within one year from our first sale. Why is Launch Gum so awesome? – We utilize a proprietary slow-release formulation, with only the highest quality ingredients and utilize a pharmaceutical grade, cold manufacturing process that ensures unmatched active ingredient retention. Short Version: we make sure the product tastes good and works. Why is Launch United so awesome? It takes grassroots, authenticity and a customer focus to a whole new level. Our sales, marketing and promotional strategies are focused on placing the power, value and dollars in the hands of our customers and our launch reps. Every action we take is aimed at supporting our customers, supporting our reps, supporting our community. With an unwavering focus on engaging, learning from and serving our customers. We are able to consistently adapt and improve through crowd sourcing and engaging directly and unfiltered with our Launch Reps. We are truly embedded in the culture we serve and have unbelievably loyal customers. Everyday we gain real-time intelligence direct from our consumers and execute to build a consistently improving 360 degree brand experience. We absolutely love what we are doing. Launch is truly a community and we consider our Launch Reps and customers our family and friends. We deal with positive, passionate, motivated and inspiring people everyday. We have a product, brand and sales structure that matches our and our friends vision of what being from our generation is truly all about. Thank You – Justin, and Launch Gum for taking the time to be my guest today! I’d like to introduce you to my friend Jake Moore [@StLCardsGuy]. Not only is he using Social Media to bring awareness to something he’s passionate about, he’s an all around great guy. He’s one of those Friends on Facebook or Twitter Followers that you look forward to their posts each and everyday. Here’s Jake’s story…in his own words. “My passion is for economic stabilization of third world countries. That’s water #1…4,500 people die each day from lack of clean drinking water. I also do things with medical programs, schools, sustainable ag & small business development. I don’t have a specific organization I work with, though, I volunteer with several and sit on the boards of some smaller ones. The two charities I work with the most are charity: water and Samaritan’s Purse. I started out as a young boy building houses for the poor overseas on summer breaks. It has always been a passion of mine. Over time I became familiar with plenty of other groups. Like I said, many are good, but I tend to focus my efforts. I raise awareness and do a number of fundraising projects like having people bring money to donate to drill wells for my 30th birthday party or where people bring gifts to give to poor kids overseas at Christmas parties. I really do a fair amount of fundraising drives, as well. There are lots of ways to get involved. charity: water has lots of self-help fundraising ideas on their site. They are a good organization because they provide lots of tools for the average person. They have posters, videos and all kinds of information for free download to spread the word. The ideas are limitless, but the easiest is to pick an event and use it to raise money. For example, you could run a marathon and get sponsors or use your birthday. They have tons of suggestions. I also work with a guy in St. Louis, the Shoe guy. He has a great program that we are trying to take national. He collects old shoes, resells them in the 3rd world by the pound and then uses the money to drill wells. Both Facebook and Twitter have their advantages. Facebook can integrate so that posts are sent to Twitter, then you can supplement facts on Twitter. You can even automate them through SocialOomph so it becomes much less time intensive. I think non-profits should be involved in social media, but that can’t be used as fundraising. People tune that out. We need it for awareness and volunteer opportunities. On a blog I would concentrate on awareness items, such as getting the word out, very simple action steps people can do, give them a form letter they can copy and fax or let them know some very simple things. Blogs can also help get the word out about what you are doing through calendar items. In addition, you can spotlight volunteers, which keeps them involved, and let others know how people can fit volunteering into their lives. Social Media Marketing should be a part of your Internet Marketing Campaign. But it’s not all about link baiting or viral marketing, which is where a lot of people are confusing Social Media. Link baiting and viral marketing are “big events” in Internet Marketing and not ongoing activities. Your business’ focus should be on the ongoing activities… those “big events” are bonuses. The most common question businesses have is: “Why should I focus on social media when all the content I need is on my website?” which is a valid question to ask. Working with Social Media involves a shift in thinking that your online strategy needs to be focused in more than one place, not just your website. The traditional thought is that your website is dependent on generating traffic from one source: search engines. Through PPC and SEO, you use the “super highway” of Google, Yahoo and MSN to drive people to your site. But, there is a whole “neighborhood” around you that you need to focus on as well. If we use a brick and mortar analogy, consider for a moment that your website is your “storefront.” Your storefront gets a lot of walk-in traffic from one road (which would be your SEO and PPC strategy to your website). But, you’re starting to notice that some new neighborhoods have sprung up in the area and contain a demographic that matches your target audience. What do you do? You wouldn’t sit there hoping your target audiences in these new neighborhoods somehow find out about your store through some random search – you’d look at expanding your business and building more stores in these new locations to meet your audience where they are. The concept of Social Media Optimization is similar. You want your website and message to appear where your audience is congregating online. Just as in any city, there are good and bad locations for your “storefront” or website. Sometimes, it’s very obvious from your research whether one neighborhood or social media site is better than another. Research is essential! Just like in the brick and mortar world, finding the best social media site for your company depends on your target audience. You don’t want to put yourself into a neighborhood that turns out differently than the way you thought it would. One thing I’m always asked from potential clients is, “How can using Social Media help grow my business?” Social media networks are a fantastic way to promote your business, connect with customers and drive traffic to your website. Just like anything else, if you want results, you’re going to have to make an effort and it will require a bit of your time. The whole team must work together (web guy or gal, graphic designer, writer, IT department, management, Virtual Assistant) as keeping everyone in the “loop” is the only way to go. Don’t expect results overnight. A successful Social Media campaign takes time. Know who you are. Get them interested in your story and use the tools available to you through social media to pique your customer’s interest and make them invested in who you are. This makes them want to share you/your business with others. Figure out your expectations – know what you want out of using Social Media. Knowing who you’re going after and where to market them, is key. Is it to drive traffic to your website? Or is it simply to get your company’s name out there? Understand your audience and build goals that are realistic and possible. All of this is fundamental in reaching your goals. The use of social media nowadays is very crucial to promote your business. So, determine where to build your communities- as in, find your customers and go wherever they are. 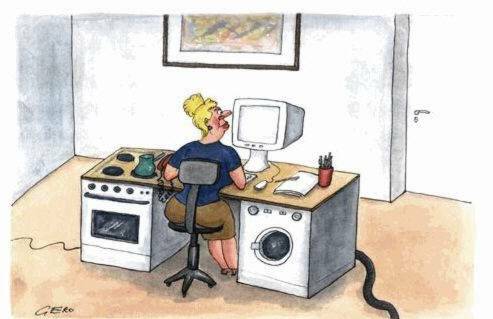 We here at The Work at Home Life blog are not the only bloggers, by far. Many of you that read our blog are bloggers yourself. Whether you blog for a living, blog as a way to promote your business or blog as just a way to have your thoughts heard, nine times out of ten, you will or already have experienced a mental block. I have and I know I will at some point again in the future. Then I came across an article with some pretty interesting tips and I thought I would share a few with you. Tell a story from childhood. What a great way to give your readers insight into the real you! You can cite a particular experience you had as the “mini you” and how that has shaped you into the wonderful person you are today. I know we all have at least one defining moment in our lives that could serve as inspiration to others. Tell a secret. Yes, I said a secret. But then, others will know right? That’s the point. Keep it in perspective, but give your readers an idea of what makes you tick. Something that you did to help advance your career or business…nothing illegal or immoral, mind you, but something that may kick start someone else’s creative juices. Let your readers know that thinking outside of the box is not only okay, but encouraged. Argue with yourself. If you have changed your mind about the role that Facebook or Twitter plays in social media today that re-blog about it. Link to an old post of yours and debate your new position. Explain to your readers why your opinion has changed. Maybe you have gone through further training in your industry or gained a better understanding of the situation as a whole. Whatever the reason, allowing your readers to see your updated perspective shows you have grown as a person and you’re not afraid of change. Write a “For Dummies Post”. Sounds silly, right? But how often have you come across others that are either interested in what you do or are just starting out and are looking perhaps for a mentor? Wouldn’t it have been easier if there were manuals or step-by-step instructions around when you first got started with your profession? Why not help someone out? Write a simplified post for those who may not be as familiar with your profession or the subject you chose to blog about. Not only will you be educating a “newbie” but it will also force you to get back to the basics. Everyone needs that from time to time, right? After all, if balancing work and family is your goal, then going back to the basics may just be what’s needed. Whatever the reason for the mental block, rest assured it will pass and ideas for your blog will again flow. Just because this may be part of your job, there is no reason why it can’t be interesting and fun, right?